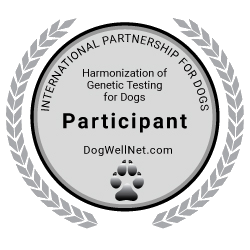 Canine cyclic neutropenia is a stem cell disorder that occurs in grey collies. Puppies are usually smaller and weaker than their littermates and by 8 to 12 weeks of age they develop clinical signs such as fever, diarrhea, joint pain, or other signs associated with eye, respiratory, or skin infections. The disorder is caused by an abnormality of the stem cells in the bone marrow, from which all blood cells are developed. The result is a cyclic fluctuation in blood cell numbers. Every 10 to 12 days the number of neutrophils drops dramatically, and then rebounds. There is an increased susceptibility to infection corresponding to the dip in neutrophil numbers. Affected dogs are subject to severe recurring bacterial infections, primarily of the respiratory or gastrointestinal tract. These dogs are also prone to bleeding episodes due to the drop in blood cells numbers. This is a serious genetic disorder. Even with the best of care, affected dogs rarely live beyond 2 or 3 years of age. The disease occurs in all grey (not merle) collies. Affected puppies have a silver grey hair coat, sometimes with a slight yellowing due to a mixture of light beige and light grey hair.